An E. coli outbreak that has sickened at least 22 people — two of them seriously — was linked by health investigators Monday to three Taco Bell restaurants in New Jersey. Investigators also were examining whether an outbreak on Long Island was connected to the fast-food chain. All but two of the people who fell ill in New Jersey had eaten at one of the fast-food restaurants between Nov. 17 and Nov. 28, authorities said. But exactly what food contained the bacteria was still unclear. "We have to find the food they all had in common," said David Papi, director of health for Middlesex County. All but four of the victims are under 18, authorities said. Five of the New Jersey victims were in the hospital Monday, including two in serious or critical condition with hemolytic uremic syndrome, which can permanently damage the kidneys, officials said. Twenty of those infected, including two restaurant employees who tested positive for E. coli but did not get sick, ate at a Taco Bell in South Plainfield; another ate at a Taco Bell in Edison; and one ate at a Taco Bell in Franklin Township, authorities said. In Long Island, an E. coli outbreak sickened at least 14 people, including 10 who ate at Taco Bell. Four restaurants were closed as a precaution in Suffolk County, and Nassau County officials asked that four additional restaurants be closed, health officials said. 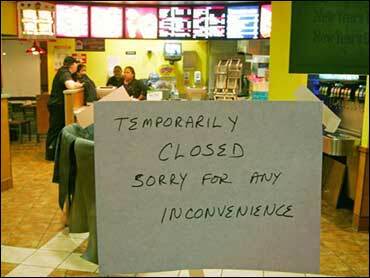 Taco Bell Corp., based in Irvine, Calif., had no immediate comment Monday. The fast food chain closed its South Plainfield restaurant last week when it first appeared that the infection might have come from there. It was not until Monday that suspicion fell on two more Taco Bells. Company spokesman Rob Poetsch said in a statement over the weekend that employees are required to adhere to strict food-handling rules. "We have taken every precaution, including temporarily closing the restaurant until the investigation is completed, as nothing is more important to us than the health and safety of our customers and employees," Poetsch said. E. coli, or Escherichia coli, is a common and ordinarily harmless bacteria the feces of humans and livestock, but certain strains can cause abdominal cramps, fever, bloody diarrhea, kidney failure, blindness, paralysis, even death. Most E. coli infections are associated with undercooked meat. The bacteria also can be found on sprouts or leafy vegetables such as spinach. Earlier this year, three people died and more than 200 fell ill from an outbreak that was traced to packaged spinach grown in California. The bacteria also can be passed from person to person if they do not thoroughly wash their hands after going to the bathroom. According to the Centers for Disease Control and Prevention, the dangerous E. coli strain 0157:H7 infects about 73,000 Americans a year and kills 61. Symptoms usually show up three to four days after a person eats contaminated food, although in some cases it can be as long as eight days, said Stephanie Brown, an epidemiologist for Middlesex County. "If they are having symptoms, then the most important thing they need to do is contact their health care provider," Brown said.